Up until now I had never ridden a bike in the Lake District, neither mtb nor road. So with a work trip to Scotland approaching I decided to plan something; it’s just off the M6 anyway! In fact a couple of weeks earlier we’d stopped off here on our way back from Scotland during a family camping holiday so plans to ride here had been formulating in my mind recently. I printed off a map, found a route suggested in a magazine and decided to park up at Pooley Bridge which is 10 minutes from the motorway. The plan to ride something similar to the magazine route from there. Of course, as mentioned before on this blog; a little local knowledge goes a long way. Parking in Pooley Bridge, in August on a sunny day is not the easiest or cheapest option. Full car parks and ‘all day’ pricing seems to be the norm. 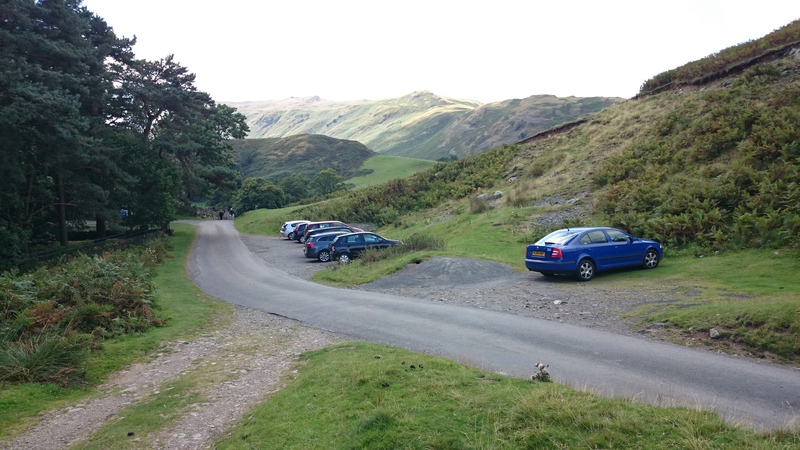 Fortunately my magazine route had mentioned some parking down near Martindale, so I carried on through Pooley Bridge, past the various camp sites and down toward Martindale in hope of finding somewhere to dump the car. I spotted a layby on the way down which was where I parked but as it turns out there’s plenty of space near the church in Martindale. If I return then that’s my revised plan next time. So enough on the logistics, how’s the riding? 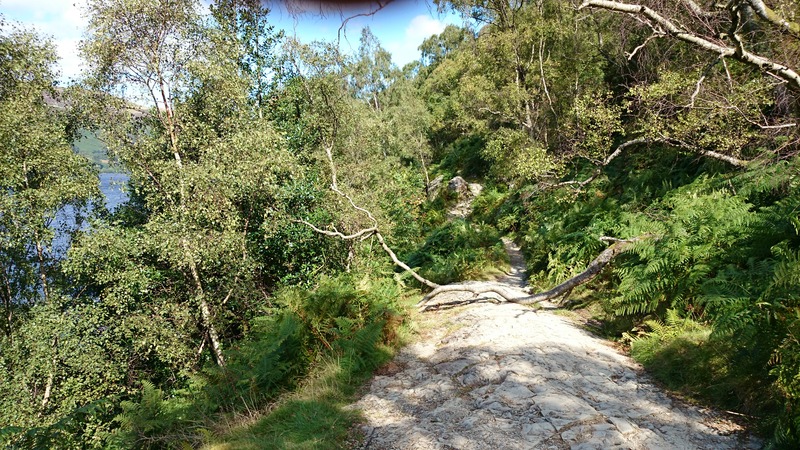 It’s a mix of fun, rocks, loose rocks, rock steps and rocky surfaced tracks. Oh and a fair bit of ‘hike-a-bike’ unfortunately. In places that’s because it’s a little too gnarly for my abilities and in others because it’s just not rideable. So maybe you’re happy riding the larger drop offs that I baulked at but unless you’re Danny MacAskill or Chris Akrigg you’re going to be carrying up the other side as 3 foot is much easier to drop off than jump up! 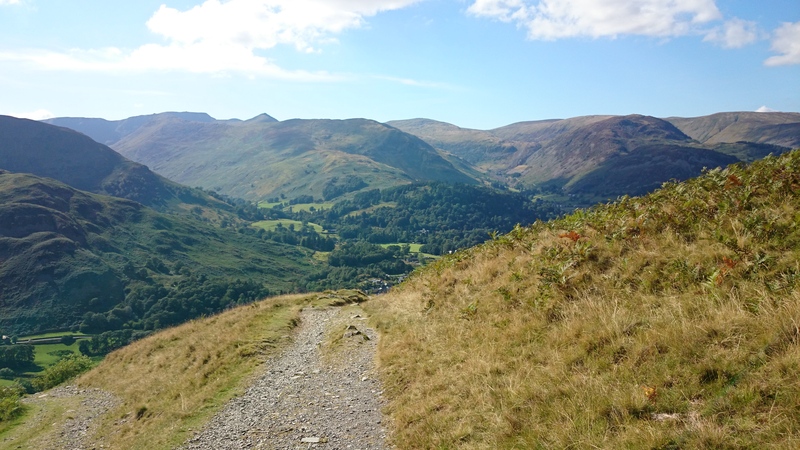 It’s also a very popular tourist destination and as well as filling the car parks you’ll find lots of groups of hikers on the trail around the lake from Martindale to Patterdale. This can be a little annoying as you can’t ride full blast on the fast bits and often you have to pull over to squeeze past people or to allow them to pass. The up side though is the occasional ‘wow’ or other such comments when people are both surprised and impressed that you can ride a bike on such surfaces. 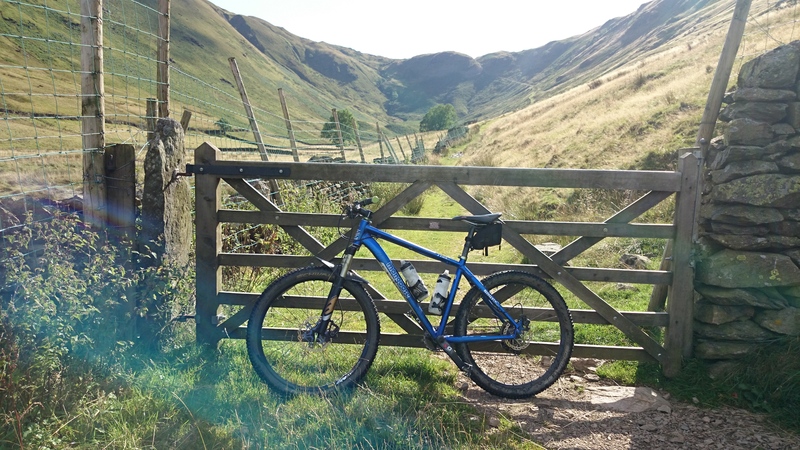 From where I parked I was able to pick up a bridleway at Howtown, just up behind the hotel, and ride a really nice fast and easy trail around to Martindale where the best parking is. From here came the real tough stuff as I made my way around the trail that runs beside the lake. As mentioned there’s plenty of bike carrying during this section but there’s also enough good riding to make it worth while doing, unless you really don’t like the rocky stuff. I then carried on round and up to Boredale whereas the magazine route had gone further on by road up to Hartsop before coming back up via a different bridleway route. It turns out that they know best and I really would advise not including the bit that I did as it’s just like a huge staircase and you’ll carry up 90% of it. Post ride reviewing on Strava revealed a max incline of 47.3% for this section! When I’d reached the Boredale descent my face fell as I found myself carrying down after having just carried up. However it’s only the first little bit that’s unrideable and I was able to get back in the saddle and blast my way down the valley soon enough, dodging past a group of girls on a school outing on the way. This descent became road a bit too soon though and I pretty quickly found myself back in Martindale and heading back by road to where I’d parked the car. I would have quite happily continued that downhill blast for a good while longer. That’s always the way with hike-a-bike rides, the downs don’t quite seem to justify the ups. In a future ride I’d like to spend a little more time and ride up from Pooley Bridge and I’d definitely choose to ride the option shown in my magazine pullout route at the Patterdale end. However having only ridden this part of the Lake District, this once, it’s be a shame on a return to the lakes, to ride the same area again. 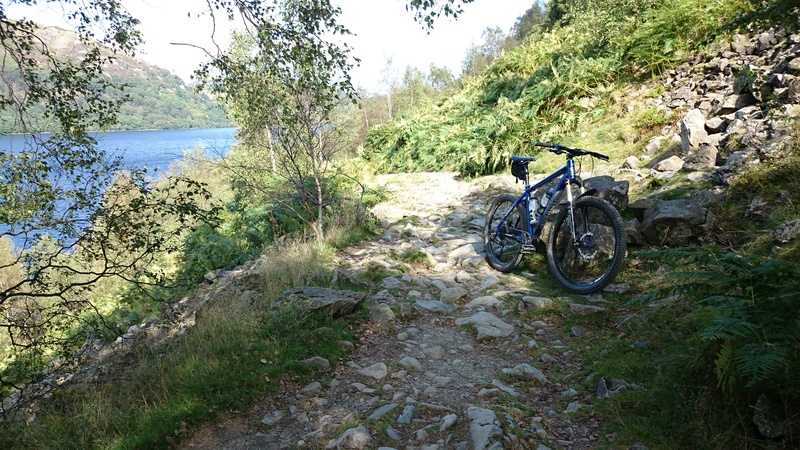 But then that’s the same with so many areas of the UK and the question always remains – do I re-ride a trail I know is good or do I explore a new area in hope of something truly awesome? I know this cheeky route well – it really is great as a stop off on route north! Lovely photos and a good write up – I want to go back and ride it again now after reading this! Thanks. It’s often a dilemma; stopping for great photos or focusing on the mountain biking!